Lessons learned and technical ramblings from 15 years in the exciting field of Information Technology, and specifically Software Development. Strong emphasis on Platform as a Service and Salesforce Platform for enterprise software development. This is the second post where I am working with the CloudBit and Salesforce.com. In my first article I made a very simple LED light up when an Opportunity in Salesforce.com moved to a stage of "Closed Won". The second time around I decided to get a little bit more creative. And what is cooler than recreating your very own Salesforce.com Dashboards in real life with some cardboard, markers, and some littleBits! For this example I created a Salesforce.com Summary Report. The report summarizes the total amount (value) of Opportunities that have a Stage of "Closed Won". Once you create the report you can create the dashboard with the report as the data source. Create a gauge chart in your dashboard and set the minimum amount to 2 million and the maximum amount to 5 million. The gauge chart maps well to the Servo littleBit. The littleBit Servo has two basic modes: Step and Turn. In turn mode you can move the Servo to a specific degree based on the voltage you pass to the Servo. You can set the voltage from 0 to 100. The littleBit Servo has an arc of 145 degrees. So you will lose some precision as you can only set integer voltage values. To give a rough voltage value you can take the range of values in your gauge (5 million max - 2 million min - 3 million range) / 145 degrees = 20689 dollars per degree in the chart. The amount of voltage is 1% of voltage = 1.45 degrees (145 degrees / 100% voltage = 1.45 volts percentage per degree). 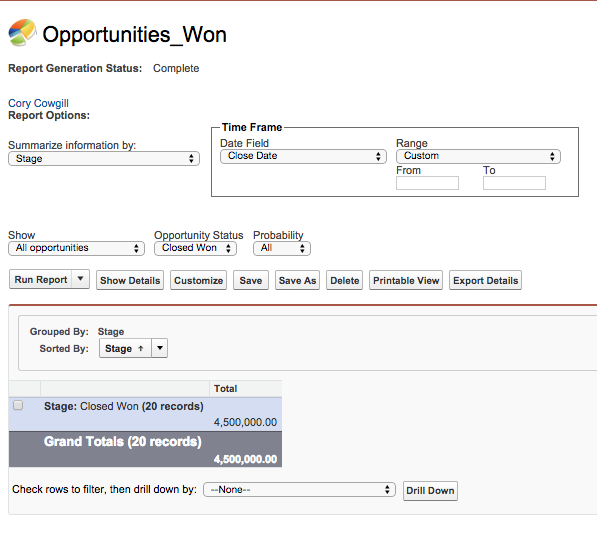 Call the Salesforce.com Analytics API to get the values from the Opportunity Report. You can use the following Apex Class which will call the Salesforce.com API and convert the values into the appropriate voltage for the littleBit API. //Set the output voltage as a percent. More voltage will send the Servo farther down the gauge. //2 Million is the bottom of gauge so subtract that from the start. Using the same Apex Class "LittleBitsManager" I created in the previous post you can call the CloudBit to set the Servo to match the Dashboard Gauge in Salesforce.com. This simple line of code will reuse our code from the previous article and use the new code above to call the CloudBit. Executing this line of code will make the "Real Life" Dashboard match the Dashboard in Salesforce.com. Let's see it in action! You can take this to the next step and make this run via Scheduled Apex every 5 minutes to create a dashboard in your office! Put additional reports and charts together with more CloudBits and littleBit components to create multiple chart dashboards!